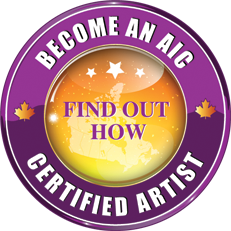 Online artist interviews with Canadian Artists on Art In Canada help you to learn more about each artist, their artistic background and what inspires their art. Neil Assenheimer is an artist from Edmonton Alberta, that has a diverse background in Makeup artistry, training, and painting. His artwork is passionate, vibrant, reflective, emotional, interpretational. His work is never ending and always evolving as he continues to find his way in the world. 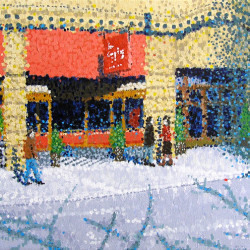 Enda Bardell is a Canadian Artist living and working in Vancouver, Canada. 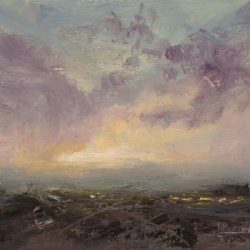 She is passionate about watercolour paintings, and creates the most wonderful sunsets using incredible, vibrant colours that command your attention as you look with awe at the pure colours she uses to paint those wonderful big skies! 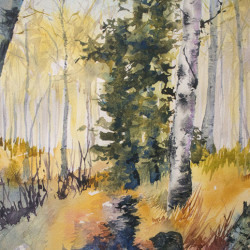 Lynda Baxter is the founder and owner of Art In Canada, and has just recently dusted off her paper and unpacked her boxes of watercolour art supplies. She's excited to start painting again and is going back to the basics, to practice watercolour techniques and to enjoy 'her time' away from the computer and the barn, and just be able to create and start over with a passion that has been with her for as long as she can remember. Lynda lives on a ranch in Southern Alberta. Land of open spaces and big skies. Everywhere she looks gets her creativity going. Her long term goal is to venture to the barn and paint their quarter horses. Each one has such a personality, and because they've bred and raised them, Lynda hopes to catch their unique personalities, and the final goal will be that her husband Greg will recognize them as soon as he sees their painting! 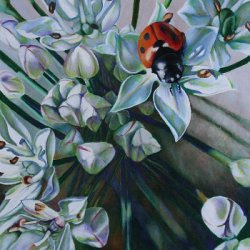 Alberta Artist Rena Bierman began painting “living ” flowers and fruit as her full time focus in 2011. 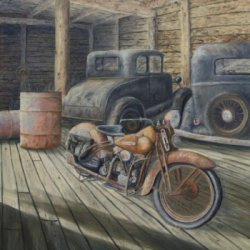 After building a body of work with that subject matter, her art is now represented in Alberta, British Columbia and Arizona. "I distinguish my florals and fruit as “living” because that’s exactly what they are. They are not cut down, put in a vase, nor are the fruit picked and put on a plate. They are as you see them in nature — alive." Rena paints colour in full chroma since flowers and fruit are not too shy to display their lavish colour. They are created to attract; she can do no less. Realistic, romantic and painterly, but not photographic. Cindy paints what she loves! 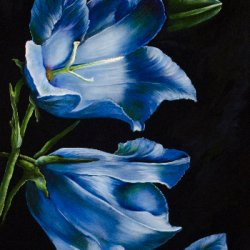 Wildlife art and nature art, landscape art from all around the world as well as still life and people. She paints the beauty of this world and shares it with others. Cindy is a signature member of Artists for Conservation. 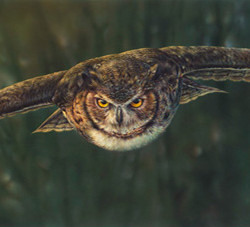 Canadian nature artist, Laura Levitsky, has gained acclaim for her spectacular depictions of the natural world. 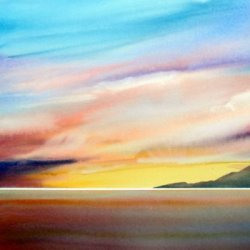 Inspired by her surroundings in British Columbia, Laura paints from a depth of knowledge and passion. An outdoor enthusiast, she travels frequently to research her subjects in their natural habitat, believing that there is no substitute for personal experience. 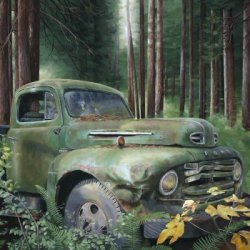 She became self-published in 2003, and by 2014, became recognized as one of BC’s representational wildlife painters with awards from Provincial and National organizations such as Ducks Unlimited Canada, BC Wildlife Federation, and the Pacific Salmon Foundation. 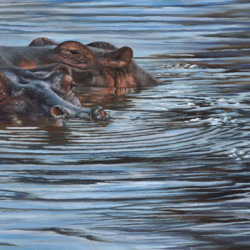 Artist Denis Mayer Jr. paints wildlife art of animals in their environment, with incredible realism. His favourite quote is “Nature never goes out of style” – Unknown author. Artist Teresa McCallum was always creative. She was inspired by her equally creative mother and grandmother. 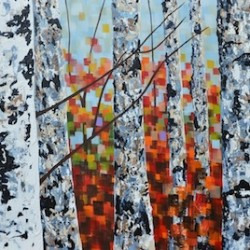 Alberta artist Roberta Murray, ASA practices art full time with an emphasis on evocative landscapes. 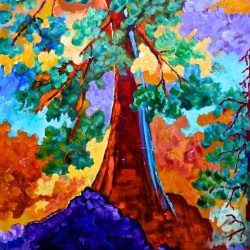 It is the images and stories of the western landscape, flora, fauna and people, which inspire her paintings and photography. Striving to capture an emotion, Roberta abandons the documentary or realist approach to produce expressive images that allow the viewer to create their own story. 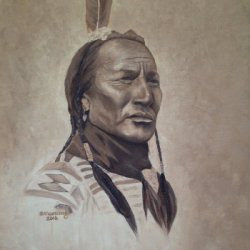 Fine art paintings and photography by Canadian artist Roberta Murray. 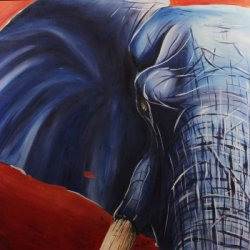 Canadian artist Barbara Pikering paints diverse subjects, from expressive faces and mood inspired seascapes and landscapes to social issues dealing with the human condition. 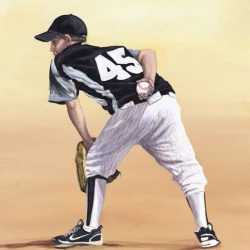 “I never limit myself to painting a singular subject matter….I love it all". Working in several mediums, she has come to love the versatility and feel of oils, and more recently, the fine work in India Ink. Barbara Pickering grew up in an Artist’s home in Canada and has been painting and drawing all her life. Her father, renowned Canadian Artist, Jack L. Pickering was a great influence in her art. To this day, they enjoy painting together and recently hosted a joint Art Show. 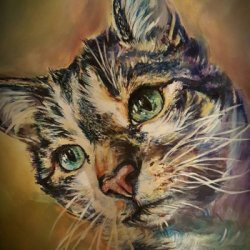 Ontario artist Chrissy Schram does commissioned art of your dogs, cats and horses to paint lasting memories of your favourite animal. She works in pencil, mixed media, and acrylic paint. She is the creator of whatwhenwhowherewhy and Chrissy Schram design freelance artist/painter/designer/illustrator. As well, she works in cartooning and comic books. Check out her family portraits!! Better yet, have her do one for your family!